Beirut- Secretary General of the United Nations (UNSG) Ban Ki-moon issued a report on Wednesday exhibiting Hezbollah and Israeli violations against the U.N. resolution 1701 on different occasions. He said that Hezbollah’s weapons do not ensure Lebanon’s protection; instead they negatively affect the Lebanese decision-making process. Hezbollah’s armed presence in Lebanon compromises and threatens Lebanon’s stability and sovereignty. The U.N. report comes after a series of decisions taken by Gulf countries against Hezbollah’s approach in Lebanon. The militant party controls governmental lawmaking offices which tipped off Lebanon’s political balance. Nabil de Freige Lebanese MP told Asharq Al-Awsat newspaper that Hezbollah’s armaments no longer serve national interest the way they did before 2000. “Ever since southern Lebanese grounds were liberated onward, Hezbollah’s armed presence affected the country’s institutional work negatively”, de Freige stressed. “We are fully aware that Hezbollah will not take any resolutions or reports into consideration, because the party’s decision on matters is in Iranian hands,” he added. The report also highlighted the attacks staged by Hezbollah against Israeli vehicles and the launching of missiles towards Israel during 2015, on the 4th of January and 20th of December respectively. The UNGS report also emphasized that the incidents, along with the Israeli retaliating response, present dangerous violations to the U.N. resolution 1701 and ceasefire. The report presented by Ban Ki-moon covers the implementation of resolution 1701 for the duration between November 5 2015 and February 26, 2016. 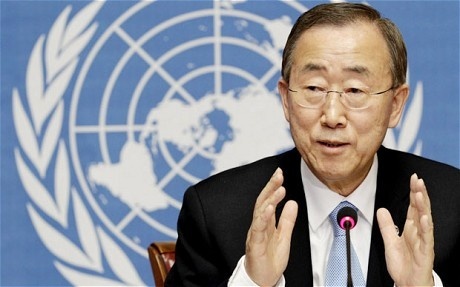 Ban Ki-moon stressed that arms possessed by Hezbollah and other off-board militias in Lebanon infringe the country’s commitments to complying with U.N. resolutions 1559 and 1701. He also expressed his deep concern regarding Hezbollah’s readiness to employ its capacity to violate resolution 1107. Ban also warned that the group’s possession of weapons and attempts to procure evolved artilleries further fuels the conflict, leading to grave consequences both Lebanon and the region will have to confront. Hezbollah, which was credited with liberating Lebanese territories from Israel in 2000 was a very popular organization in Lebanon and throughout the Arab world. But according to analysts ever since the Lebanese territories were liberated Hezbollah has become a huge liability for Lebanon. In 2005 former Lebanese PM Rafik Hariri was assassinated and 5 Hezbollah members were accused of being behind his murder and are being tried by the Special Tribunal for Lebanon. In 2006 Hezbollah kidnapped 3 Israeli soldiers which triggered a a war with Israel that devastated Lebanon. Soon after the war ended it tried to use its arms to bring down the government of former PM Fouad Siniora. In 2008 Hezbollah pointed its guns against the Lebanese people when it occupied more than half of Beirut and tried but failed to occupy Mt Lebanon . In 2011 it brought down the government of former PM Saad Hariri and reportedly used its arms to force progressive socialist party leader MP Walid Jumblatt and his parliamentary bloc to vote for their candidate Nagib Mikati as the new premier . Hezbollah’s current support for the Syrian regime in its brutal crackdown against the pro democracy uprising is another main concern for the Lebanese people, analysts say. Ever since the term of president Michel Suleiman ended in May 2014 Lebanon has been without a president. Hezbollah and its backer Iran are being blamed for the presidential vacuum. In February Saudi Arabia suspended a $4 billion grant for the Lebanese army and security forces because of Hezbollah’s attacks against the kingdom and for interfering in the internal affairs of neighboring countries . This was followed by branding Hezbollah a terrorist organization by the Saudi-led Gulf Cooperation Council (GCC) and the Arab League. All the Gulf countries have since issued travel advisories against travel to Lebanon and started deporting Lebanese expats and their families. Iran’s Party of God is going to shiite. No, if they (Hezb) are not crazy… then the rest of the world must be. Islamic Republic of Iran Jihad terrorist group, nothing less. A fair assessment … necessarily short. Is this not the root of the problem? And what about the FSA terrorists trying to enter Lebanon to kidnap and behead soldiers, create chaos and launch bases for their terrorist acts against Syria? The army by itself is incapable. Period. Hezb is needed now more than any time before for Lebanese security and sovereignty on its borders. From terrorist FSA supporters perspective yes!